Semantics, says the Online Etymology Dictionary, is the science of meaning in language. To be understood, we need words to mean what the receiver thinks they mean. Semantics matter. What about creating new phrases? When we choose coined terms, we’re usually communicating to insiders—others who’ve read the same literature. These terms often come from specific non-profit groups or individuals claiming to advance a groundbreaking theory. The use of a coined term even in a small group of insiders can cause misunderstandings, for it might suggest agreement with the whole kit and caboodle set out by the phrase’s inventor. You might ask: Isn’t vegan a coined term? And so it is. But in its 70 years of use, it has become plain language. The word was offered by a community rather than an individual, and it functions as an essential signal to a unique and liberating pathway. It draws on a principle known and expressed for many generations, and channels it into a social movement’s terms. Beyond that, the animal-rights idea takes no special jargon to explain. The idea that animal husbandry involves inflicting unnecessary harm is not a novel theory; it appears in Henry Salt’s 1892 book Animals’ Rights Considered in Relation to Social Progress. International Vegetarian Union historian John Davis says that although Salt died five years before the founding of The Vegan Society, the last 55 years of Salt’s life were lived (as we now say) vegan. Much term-coining and buzzword creation that’s come along since vegan has muddied clear waters, as our competitive culture promotes the act of personal marking—branding, to use today’s infelicitous term—on something that could just be straightforwardly recalled. 1. Welfarist. For anyone who missed the “abolition-versus-welfare” back-and-forth, a quick synopsis. The animal-rights ideal would mean everyone opts out of using other animals. Instead of making that clear, charities continue to use heart-wrenching images and vow to fix the most “barbaric” abuses. Pity doesn’t challenge the status quo. A donation to reduce spectacular suffering can affirm the donor’s superior status in the system, changing nothing. PETA asks restaurant chains to prefer chicken suppliers that use gas slaughter technique. If any businesses enter into such preference agreements, PETA will publicize their promises to consider better animal welfare. Because it’s been connected to this kind of industrial whitewashing, welfare is used by some critics as a negative word; people who promote minor changes in animal enterprises are derided as welfarists. But does the word welfare have anything to do with the way businesses adjust their handling of the animals they own, use, and ultimately kill? 2. “Stop factory farming!” Can we object to all animal farming at once? Even the small, family-run farm violates other beings’ most basic personal interests, beginning with the purpose-breeding of them because we can. And such farms still use resources that could feed hungry humans. Mathematician Adam Merberg published rough calculations suggesting a well-known free-range farm uses more calories in feed than it produces in food; and with the needless waste they generate, these property developments degrade water, soil and air. The very existence of any pastureland signifies predator removal. There is no benign animal agribusiness. Not for the planet, ourselves, the animals we’ve domesticated or those we haven’t. 3. Euthanasia. The term means a good death. It does not mean killing refugees to make space or save resources. Starting today, let’s all rule out the term euthanasia to mean the cold-blooded killing of a bear who chased a camper, or the death of a dog in a so-called shelter. 4. Companion animals. It’s not fair to selectively breed other animals to suit our desires, then call them companions as though they chose to hang out with us. I know: this is a tough one. Most people reading Vegan Place care for and love individual animals in our homes. So it can be hard for us to challenge the practice of keeping household animals. It might feel unloving. But step back and consider how they got here. These animals’ domestication is based on neoteny—the purposeful retention, in an adult cat or dog, of juvenile characteristics that prompt an animal to need and solicit care. Most vegans already agree that nursing on another species is weird, and indeed that selectively breeding animals so we can take their milk is weird. Isn’t it also weird to want wolves and wildcats selectively bred so we can make them forever dependent? And fashioning toys out of powerful wolves and wildcats—separating them from their families, buying and selling them, subjecting them to praise or punishment at whim, making ourselves their indispensable overseers—can hardly be justified on the grounds that pets benefit from the arrangement. Did it really benefit wolves to become Schnauzers? The land that is now the United States was once home to hundreds of thousands of wolves. Today, it has a few thousand wolves and 80 million domesticated dogs. If we’re honest with ourselves, we’ll admit that we have, over time, forced free souls into submission. And when we think of it that way, companionship is an unfair term. 5. “Why love one but eat the other?” I’d think genuine advocacy seeks to cultivate an attitude of respect, not love in a system of inequality. If so, the best thing we can do as teachers is to inspire communities to respect other animals’ natural freedom and power—all that is taken away when we transform the Earth’s other conscious life into shapes that please us. The vegan issue isn’t about why we only eat one, but why we purpose-breed either. 6. Farm animal rights movement. There is no such thing. To animal agribusiness, the effective response is conscientious objection. Those who feel they are missing an ethical duty by not showing undercover videos or lobbying for animal-husbandry adjustments might consider farmer Harold Brown’s counsel: Let the animal farmers themselves improve conditions (they will, for PR reasons) as the vegan movement grows without them. Leave them without assistance, threats, cajoling or praise. It’s not the advocate’s role to police an abusive system. 7. Farmed animals. Why, instead of farm animals, has it become fashionable to say farmed animals? As in: animals who just happen to be farmed? It’s not as though we could just stop using them on farms, and the problem is solved. These animals have been selectively bred as farm animals: to be as easily confined and herded as we can make them. We need to do more than rescue them from farm use; we need to challenge the purpose-breeding at the root of the wrong. 8. Vegan cats. One of these words is not like the other… Veganism is an ethic that can be safely, harmlessly, naturally embraced by human primates. Forget about forcing cats to eat plants, and start getting vocal about the making of pets in the first place. See #4. 9. Single-issue campaigns. Should we dismiss the defending of any targeted group because it’s “single-issue”? What wrong done to a community or even to one person is beneath concern? All lives matter. 10. Wildlife. Aren’t we talking about animal communities? The word wildlife can mean plants as well as animals. Moreover, wild means uncultivated—a concept that falls short of representing the complexities of the non-human lives, systems, and interactions. 11. Humane, non-lethal alternatives. Don’t do it. Don’t ask managers to put free-living animals on birth control rather than shoot them. Earlier on this blog I shared my column examining the way forcing contraception on animals became confused with advocacy; here is that link again. Read it and weep for the deer of Valley Forge National Historical Park and at several other National Parks in the eastern United States, where plans are being carried out to kill kill kill for as many years as park managers say so—until they get approval for some disappear-deer drug. The Natural Resources Director at Valley Forge claimed to have implemented this plan as a compromise with animal-rights activists. 12. Ethical vegan (also: abolitionist vegan). There is no unethical or pro-exploitation kind of veganism. Nor must we establish subcategories, subcultures, or exclusive clubs for only certain vegans. Vegan is vegan. 13. Meatless. Meat means an article of food or an essential part of something. It’s the term animal agribusiness which covers all the interconnected exploitation of an industry at once—and doesn’t suggest that vegans lack anything. 14. Veg. Nobody knows what that means. 15. Vegan options. How about vegan offerings? In contrast to the if-we’re-lucky connotation of options, vegan offerings has a ring of confident generosity. Let’s imagine, discuss, and create a culture that makes animal farms history, one where vegan living is embraced as the way to sustain our world. Thanks to Meg Graney and Kate Sparkman Sharadin for helpful online comments that got me in the mood to write this up. Source of banner detail: Shop With Meaning. 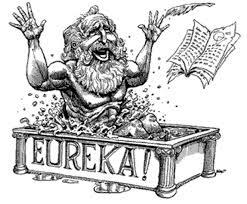 Source of Eureka! drawing: EspacioTiempo (PDF). 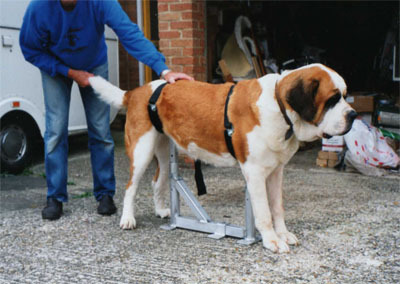 Source of St. Bernard breeding rack photo: Stornum Kennels.